From 1932 until his death, Leon Davis, founder of District 1199, fought tirelessly for the rights of skilled and unskilled workers. District 1199 began in New York City as a union of pharmacists, porters, “soda jerks,” clerks and cosmeticians. Our founders believed all workers in one industry should organize together to gain power. Professionals and service workers, as well as people of different religions, races, and political views — all of whom work for the same company — should stand together and use their strength to help themselves and all working people. By 1959, District 1199 organized more than 90 percent of all the pharmacy workers within New York City and had begun to organize the city’s huge voluntary hospitals. By the 1960s, Leon Davis and District 1199 fanned out through the country to organize and create a national union of health care workers in all sections of the health care industry — from hospitals and nursing homes to mental health clinics. District 1199’s growth and organizing during the 1960s was more than a union fight. Leon Davis, 1199 organizing director Elliott Godoff, and 1199 members used their new and vibrant Union to demand social and economic changes for all workers. 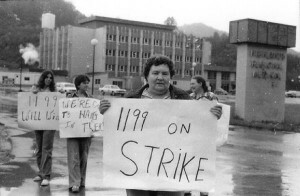 By the mid-1970s, District 1199’s organizing call reached toward hospitals and nursing homes in West Virginia. The organizing momentum spread to Highlands Regional Medical Center in Prestonsburg, KY, to Oak Pavilion Nursing Home in Cincinnati, OH, as well as to Appalachian hospitals. Healthcare and social service workers saw a crisis in their communities and knew that to get better wages, benefits, and care for their patients, they needed to unite with workers who did the same jobs, creating District 1199 WV/KY/OH. In the 1980s, when many unions in the industrial Midwest struggled to survive, District 1199 organized and grew. In 1982, District 1199 organized state hospital workers in West Virginia, and in 1986, the union organized the health care and social service professionals working for the State of Ohio, doubling the size of the union to almost 6,000 members. The next big step came in 1989, when District 1199 members voted overwhelmingly to affiliate with the 1.4 million members of the Service Employees International Union, the largest health care union in the country and the largest and fastest growing union in the AFL-CIO. We grew in 2001, when more than 4,000 members from District 925 in Cleveland and Cincinnati voted to merge with District 1199, bringing new industries and ideas into the union. In addition to health care and social services, SEIU District 1199 represents Head Start, library and higher education workers. The merging didn’t end there. That same year, the 1,500 members of the Cleveland-area Social Agencies Employees Union (SAEU) merged with District 1199, bringing more strength to the union. This merger didn’t just add numbers, but reintroduced a fresh outlook and new enthusiasm. Today, District 1199 has the power to win and represents nearly 30,000 workers. Following in the footsteps of our founding organizers and civil rights pioneers, District 1199 continues its aggressive organizing program to win for our members and to create a more just and humane society. By bringing new workers into our union family, we increase workers’ power to demand dignity, family-supporting jobs, rights, and respect for all health care and public service workers. Comments about Union History are welcome. Off-topic comments and other violations of our community guidelines may be withheld or removed. Comments do not appear immediately after posting.